By now, most of us know that plastic water bottles are bad for us and bad for the environment. But have you ever wondered about the quality of the water itself? Many studies show that bottled water is often no different than tap water. One of our favorite non-profits, The Environmental Working Group, is running a special Bottled Water Label Scavenger Hunt to help discover what’s in our bottled water. Until June 15, simply collect and send labels, and you’ll be helping the group collect samples to test. Plus, you’ll be entered to win a free reusable bottle and reusable bag. - Collect labels from any non-sparkling, unflavored bottled water. - Write down the name & location of the store you bought it from, date of purchase, and your name, email and mailing address. Our Take: Bottled water is a waste – consuming tremendous resources to produce, then sitting in landfills or littering our streets – and all for something we can basically get for free. Adopting a high quality reusable water bottle is one of the simplest changes we all can make. 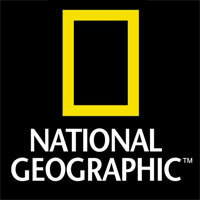 Learn more about the problems with plastic bottles here. 2008 was a tipping point for several important consumption issues that we cover. It marked the beginning of the end for BPA, Seattle voted to tax the plastic bag, and stores everywhere were flooded with an onslaught of cheap reusable shopping bags. Our products were featured by author Helen Coronato as an easy, affordable solution to greening your lunchbox. But well-meaning companies and consumers are finding that shopping bags, like biofuels, are another area where it’s complicated to go green. “If you don’t reuse them, you’re actually worse off by taking one of them,” says Bob Lilenfeld, author of the Use Les Stuff Report, an online newsletter about waste prevention. But then things go south. Unfortunately, the article makes it sound as if people are incapable of changing habits & remembering to bring their bags with them (quoting a very low number from a PB industry person, no less!). Bringing reusable shopping bags is no harder that doing simple things like remembering to turn off the lights when you leave your house (or water when you're brushing your teeth) – comparing it to taking 30 sec showers is extreme. The closing quote, from a woman buying a silly $45 bag from London, reinforces the stereotype that all reusable bags are trendy and impractical, and further clouds the waters. To date, we've awakened millions and empowered 160,000 customers – all with simple practical products and tips to reduce plastic and paper bags – the flood of testimonials we get gives us solid evidence they're experiencing powerful transformative results. Reusable bags don't have to put fashion before function or be festooned with a cheesy "I'm so green" eco-slogan. There are basic, practical choices available that are being used day in and day out that do indeed make a difference. Trendy options at both ends of the spectrum are not the solution – and thankfully, far from the only choice. If lunch sacks made from organic cotton or recycled plastic soda bottles are more your children's bag, reusablebags.com offers a cool selection too — some even come with nontoxic reusable freezer packs. As reusable bags continue down the path from obscure eco-crusader tool to trendy fashion accessory, the debate continues on what to do about all those plastic bags. 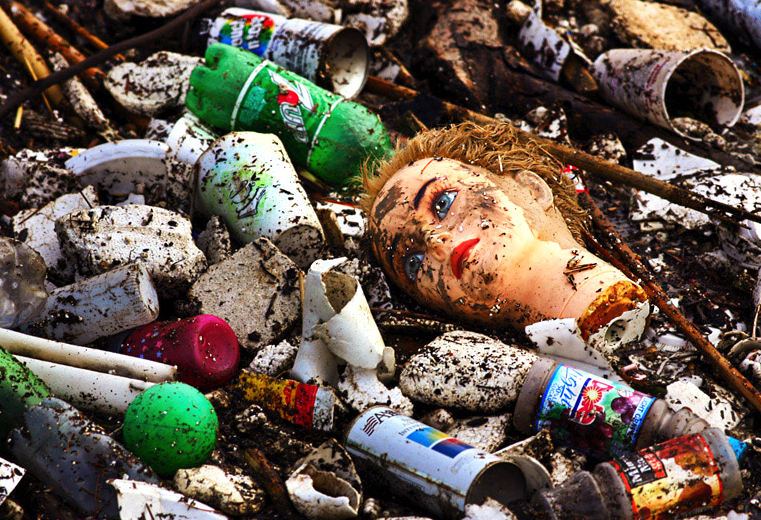 Some say bans are the answer; others claim that recycling will solve the problem. Vincent Cobb of reusablebags.com argues that the behavior we need to change is the mindless overconsumption of use-and-toss items. Vincent Cobb, founder and president of www.reusablebags.com based in downtown Chicago, is not a fan of the newfound trendiness of reusable bags. "The heart of the problem is that people are consuming too much," he said. "The problem with the free bags or the 99 cent bag is people have a tendency to accumulate them and not use them." He advised shoppers to purchase a high-quality bag that will last. A new bill to be introduced to the House Appropriations Committee next month might require large grocery stores to charge customers up to a quarter to take away paper or plastic bags. Last year, San Francisco's Board of Supervisors banned petroleum-based plastic bags in large markets and pharmacies. You can easily ban paper and plastic from your own life. Plastic bags have become a target of the environmental movement, and with good reason: Plastic bags aren't biodegradable. Instead, they break down into smaller and smaller toxic particles that contaminate both soil and water, and can enter the food chain when animals accidentally ingest them. And according to the EPA, we use more than 100 billion plastic shopping bags every year. If you're a certain type of person, it's not enough that your reusable grocery bag holds groceries. It must also establish your style. With designers getting in on the action, a Self magazine headline sums up the challenge: "Look chic at the farmers market." Statistics on reusable-bag production are hard to come by, but when I asked Vincent Cobb, founder and president of reusablebags.com, if the solution is becoming part of the problem, he didn't hesitate a moment. "Absolutely," he said, explaining that some are made so cheaply they fall apart after a few uses. "They are becoming more of the junk." Eco-Challenge: Is Going Bagless Possible? All-or-nothing mentalities are seductive, but often self-defeating. Not to mention silly. When I come home and realize I've left the lights on -- which of course I do every now and then -- I don't resign myself to being an electricity profligate. I let it go and move on. Perhaps a recalibration -- less superego, more compassion and ease -- would help my bag plight. Link: Eco-Challenge: Is Going Bagless Possible? • Pledge to use your own reusable bags and persuade your friends to do the same. • If you buy reusable bags, use them: Put a note on top of your grocery list reminding you to take the bags with you to the market. 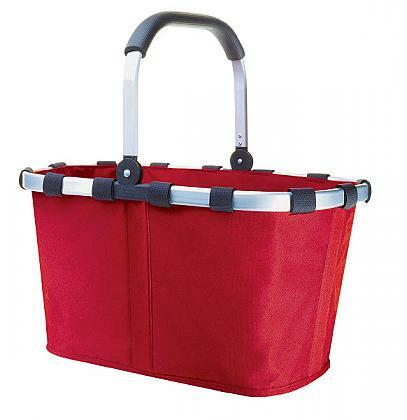 • Persuade stores to offer credit for using your own bag. • Realize that paper is not necessarily a better alternative. Trees must be cut down, and paper mills can pollute. 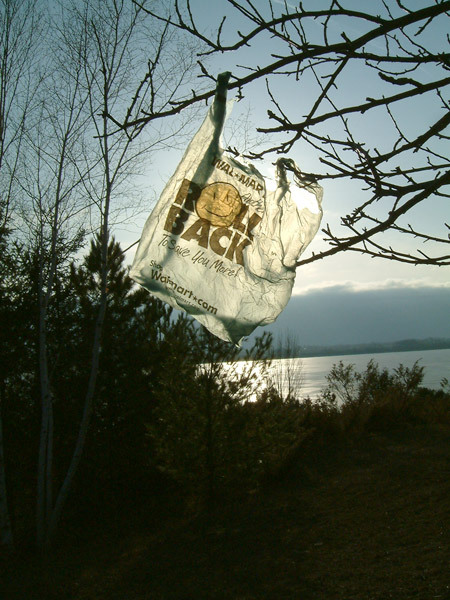 • If you belong to an environmental or community organization, lobby to have the plastic bag issue added to the agenda. "Demand has exploded" for shopping bags that are neither plastic nor paper, agrees Vincent Cobb, founder of reusablebags.com, which was endorsed by Al Gore in his best-selling documentary An Inconvenient Truth. "We sold more this Earth Day and the day after than we did in the whole of 2003." Cobb thinks they started being mainstream and "very trendy" after last year's Earth Day, when using your own shopping bags appeared on just about every media list of top 10 things consumers can do to help the environment. "A big shift is under way." Our founder, Vincent Cobb, talks to the Amy & Bryan Morning Show during Earth Day week about reusable bags – including the hidden costs of plastic bags and the myth of biodegradable plastic bags. Plus, a round-up of popular reusable bags and bottles, and how to make the right choice. Tupperware parties are old hat: nowadays, “eco-moms” are getting together to trade tips on how to save the environment. NBC’s Janet Shamlian reports. 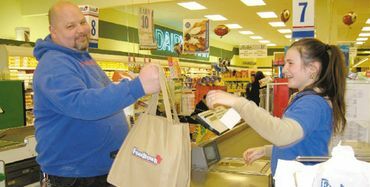 We’ve all experienced frustration at the checkout counter when a bagger uses a different plastic bag for each item or even worse, double bags our groceries for “extra support”. Now that the practice of using reusable bags is catching on, it seems that the new common challenge is confusion at the checkout. Improved training on the part of stores will help, as will well-designed reusable bags that streamline the process. Our Take: Several readers’ comments brought up the fact that the el cheapo “99 cent” reusable shopping bags have a tendency to fall apart --one of a number of problems associated with the explosion of “freebie” reusable shopping bags being produced by many retailers. Our advice is to resist accumulating cheap bags and invest in a handful of well-designed, attractive, durable ones that you will actually use for years to come. Hear from ReusableBags.com Founder, Vincent Cobb, who discusses how Ireland's Plastax (which helped reduce consumption of plastic bags in Ireland by 90%) inspired him. The Plastax "is the wave of what's going to happen next"
Hear from ReusableBags.com Founder, Vincent Cobb, who speaks about plastic bags as a symbol of society's overconsumption, as well as their environmental impacts. "Now you have ReusableBags.com, a site that sells a variety of bags designed with functionality and even fashion in mind." ReusableBags.com was featured as one of CLTV Metromix's "Green Pieces." Hear from Founder, Vincent Cobb, and view many of our products! View Good Morning America Now's segment on BYO-Bag. With a focus on how to remember your reusable shopping bags, many of the samples featured were from our store. Guest Olivia Zaleski "really recommend(s) looking at that website. They have everything for everyone." Judith Morton fits the profile of an eco-friendly consumer: She worries about depleting natural resources, she recycles when she can, and she has three or four canvas shopping bags sitting at home. Despite her good intentions, Morton's reusable shopping bags rarely leave her house, meaning that she still accumulates dozens of flimsy plastic grocery bags. While thousands of shoppers have shifted to BYOB -- bring your own bag -- in lieu of answering the old "paper or plastic" question, many consumers struggle to make the switch. "Our biggest concern with reusable bags is that people will get them and not use them," said Vincent Cobb, founder and president of Reusablebags.com, a Chicago-based Web site that promotes and sells reusable bags. "You're not going to fix the problem overnight. We've been programmed to shop this way. What's hard is not giving up." Paper or plastic? Neither, thank you. That’s what eco-savvy consumers are saying these days when they go shopping. They’re shunning both in favor of BYOB — bring your own bag. Most grocery stores have their own branded versions. They’ve also proliferated online at such sites as Denverbased delight.com and reusablebags.com, the latter of which features a counter that flashes the number of plastic bags used this year — more than 51 billion and counting, the last time we looked. Also included are tips from reusablebags.com on how to become a more eco-friendly shopper. In 2002, Ireland passed a tax on plastic bags...Within weeks, plastic bag use dropped 94 percent. Drowning in a sea of plastic bags, countries from China to Australia, cities from San Francisco to New York have in the past year adopted a flurry of laws and regulations to address the problem, so far with mixed success. Comment: Ireland has paved the way. What other countries, cities or states will step up, find the political will and follow suit? In Illinois, members of a recycling task force are brainstorming ways to reduce plastic bag waste but an outright ban on the petroleum-based bags is not likely. However, the Illinois General Assembly passed the Plastic Bag Recycling Act, calling for a voluntary, two-year pilot program in Lake County to determine the cost to retailers who implement plastic bag recycling programs. But some, like Vincent Cobb, are inspired by Ireland's "Plastax" example and think it could be implemented in the United States. "Retailers were resisting it initially, but at the end of the day they’re going to save a heck of a lot of money," said Cobb, who founded Chicago-based Reusablebags.com, which sells its own line of reusable shopping bags. Our Take: Measures like this highlight the 2 extremes - on one side is a complete ban of plastic bags, which puts retailers on the defensive, and on the other is a mandate to recycle bags, which does nothing to curb consumption. We're interested in the middle ground, and advocate reusable bags which both curb consumption and limit the use of plastic bags. Whether it's about peer pressure, a deepening environmental conscience or a head start on the upscale grocery chain's campaign to ban plastic bags by Earth Day, far more customers are carrying their foodstuffs home in paper and reusable cloth sacks. "It kind of blew me away with how quickly it took off," says Vincent Cobb, founder of Chicago-based ReusableBags.com, a cloth-bag retailer that has been advocating on the issue for the past five years. For organic grocery store Whole Foods, the difference between them and the competition is in the bag. The national supermarket chain, including its two Tempe locations, will stop using plastic grocery bags starting Earth Day, April 22. Plastic bag bans are gaining momentum in New York, China and Australia according to the advocacy site and online store reusablebags.com. 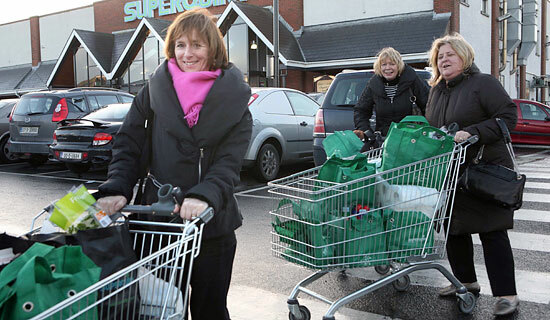 Ireland began taxing the bags in 2002, leading to a 90 percent drop in the bags' use. Plastic shopping bags, your day is done. That's the overwhelming sentiment lately as retail businesses and lawmakers take strides to eliminate the eco-hazardous items from store inventories. Here's the 411 on why plastic bags harm the environment, according to Reusablebags.com, a Chicago company that sells, well, reusable bags: Plastic bags, which are made from petroleum by-products, aren't biodegradable. They slowly break down into tiny toxic bits, contaminating soil and waterways and eventually find their way into the food chain when animals unknowingly ingest them. Reusable grocery bags might not sound very Earth-saving, but they can be if more people started to use them. Reusablebags.com launched in August 2003 and the site is very well-respected. It sells fashionable reusable bags in all sizes as well as featuring news articles and a plentiful amount of vital information about the environment. "My advice to everyone is to refuse plastic whenever possible, reuse plastic bags you do get and use reusable shopping bags," Reusablebags.com President Vincent Cobb said. 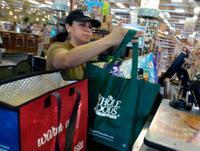 "Soon it will be odd to not use reusable shopping bags. This trend will get more popular over the coming years." Al Gore, former vice president, talks about using reusable bags in his book and movie, "An Inconvenient Truth." Reusablebags.com was even mentioned and endorsed by Gore. As said in the book, "... carry a reusable bag and when asked paper or plastic, say neither." Reusable.com has sold about 250,000 bags since the site started and it plans to sell tons more. Reusable grocery bags are popping up at stores all over, and not only in places where you buy groceries. 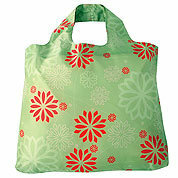 The bags have gotten hipper and more affordable, too, with many retailers introducing totes as low as 99 cents. Today, it’s not so hard to find one on eBay. It's impossible to count how many customers are reusing bags, but area retailers say they've seen an uptick in recent months. Plastic bags are an easy target for retailers trying to go green, since they take oil to make and fill landfills. But some experts say that the practice will stick around even after the fad wears off. "There's a trendiness to it, but the underlying fundamentals are there," said Vincent Cobb of reusablebags.com. "There's something permanent in the society moving forward. 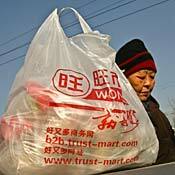 And there will start to be a little stigma to the plastic bags." Prompted by environmental and consumer concerns, some grocery stores are banning thin plastic bags this spring. The super-thin grocery bag, usually made out of polyethylene film, came along just 25 years ago to alleviate our burdens, and in that short time it has spread across the world like an urban tumbleweed. The global use of plastic bags amounts to 100 billion a year, according to the Film and Bag Federation, an industry trade group. Others say it's much higher, approaching 100 billion in the United States alone. The website Reusablebags.com has a running ticker of U.S. bag consumption which, as of last night, topped 29 billion. Paper or Your Reusable Bag? New York City is requiring new measures to increase the recyling of plastic shopping bags. China has announced it's banning them. Such measures are making reusable bags a big business. Host Tess Vigeland talks with Vincent Cobb, president of Reusablebags.com. Link: Paper or Your Reusable Bag? Chicago-based ReusableBags.com is the People's Choice for Green Business of the Year from Co-op America. The Award was announced this month at the San Francisco Green Festival. 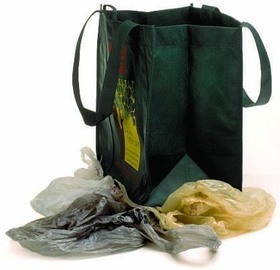 ReusableBags.com estimates that it has helped 70,000 customers to reduce their consumption of use-and-toss items (such as petroleum-based plastic shopping bags) by 190 million units. ReusableBags.com Founder Vincent Cobb said: "Our ongoing mission since day one has been to change the status quo of society's use-and-toss mentality by providing sound, practical ideas and products. We were honored to be nominated the past two years for this Award. And it is a thrill to be the winner of this attention in 2007." ReusableBags.com made MSN's recent list. According to MSN.com, you can be proud of yourselves, even if you can only make one or two of these green changes. 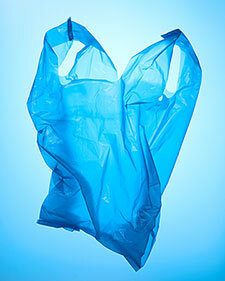 Check out Strategy 6: Reuse plastic bags. "Instead of chucking 100 billion plastic sacks a year (wow! ), try and get a second, third, or tenth use out of them. 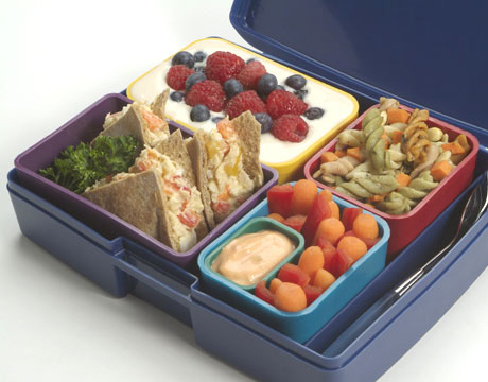 Tote your lunch to work or your groceries home, or at least use them as garbage bags. Better yet, next time you shop, try a reusable bag. Learn how at ReusableBags.com." In the wake of San Francisco's recent ban on plastic grocery bags, other jurisdictions from Los Angeles to New Jersey are considering restrictions on the use of plastic bags. And since last summer, California law has required all large supermarkets to offer reusable bags for sale. Meanwhile, worries about climate change and marine pollution are leading more individual consumers throughout the country to answer "none of the above" when faced with the cliched choice of "Paper or plastic?" "The market has absolutely exploded," said Vincent Cobb, founder of ReusableBags.com, an online store that has sold a wide selection of grocery totes since 2002. "If you asked me two years ago, there were dozens of reusable bags. Now there are a hundred or more."